China's first domestically built aircraft carrier Type 001A embarked on its third sea trial on Sunday, in which the vessel's weapons system, control system and communications system will undergo further tests, a Chinese military insider said on Monday. The Type 001A set out from the Dalian Shipyard in Northeast China's Liaoning Province on Sunday morning, Hong Kong-based newspaper Takungpao reported on Monday. Wang Yunfei, a naval expert and retired People's Liberation Army Navy officer, told the Global Times on Monday that the third sea trial will focus on the vessel's weapons system, control system and communications system. 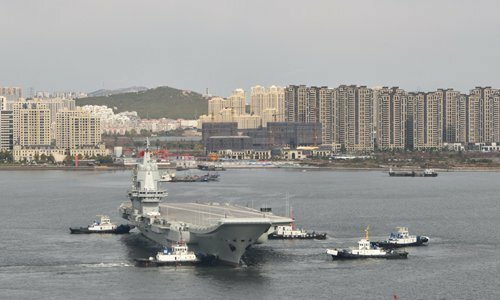 In the first and second sea trials in May and September, respectively, the carrier had tested its power system, Wang noted. While many military observers expect carrier-based aircraft to conduct takeoff and landing tests in the third sea trial, Wang said it may be too early for now, as tests for its communications, navigation and landing systems must come first. The aircraft carrier is being accompanied by a barracks ship. This is the first time the barracks ship joined the Type 001A for a sea trial, Takungpao said. "The barracks ship will not only provide support but will also join supply tasks, like cargo transfers and refueling," Wang said. A military exercise is scheduled from Sunday to November 6 in the northern Yellow Sea, according to a statement the Liaoning Maritime Safety Administration released on Friday. Ships are prohibited from entering the designated area, it said. Takungpao said the scheduled military exercise matches the time and location for the sea trial, which means the Type 001A is expected to return on November 6. On the future of the aircraft carrier, Wang said that he expects to see drones with folding wings on the flight deck. The Aeromarine Intelligent Equipment Co Ltd under the China Shipbuilding Industry Corporation released a statement on Sunday saying that the company will participate in Airshow China 2018 in Zhuhai, South China's Guangdong Province for the first time in November. The statement came with an illustration of a drone with folding wings codenamed HK-5000G, which is expected to be on display at the air show. However, Wang said that China's development of carrier-based drones is still at an early phase and may not be deployed anytime soon.